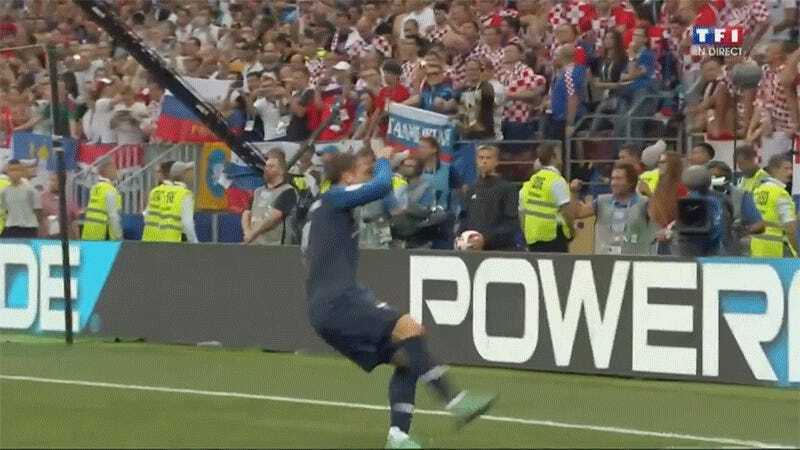 In the World Cup final between France and Croatia, player Antoine Griezmann celebrated in the rudest way possible: with an emote dance from Fortnite. “Take the L” is an emote in Fortnite that truly, brutally taunts other players. As you can see in the video below, the character puts their hand up to their face in an “L” shape and then begins to kick their feet back and forth. Take the loss, it seems to scream, because I am totally making fun of you right now. I never would have thought that I would see that after a goal in a World Cup final, but here we are. The celebration was incurred after a penalty kick against Croatia, and it has to be said that Griezmann has the emote down pretty well. Maybe touchdown dances will return with a strong Fortnite flavor. Could we catch someone sliding into home base doing the floss dance?